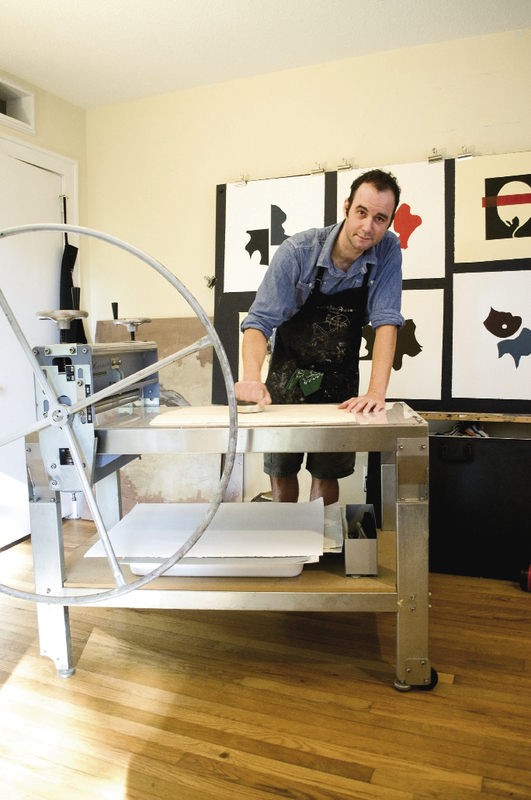 In his Avondale home studio, Ailstock creates monoprints, woodcuts, and etchings on an etching press. Asking Charles Ailstock what type of visual art he creates is akin to questioning Roger Ebert about his favorite genre of film; each bases their career around a boundless interest in their art form’s entirety. Growing up in Charleston, Ailstock filled notebooks with avian sketches, inspired by bird-watching with his mother. 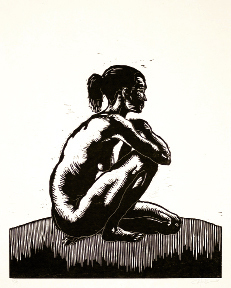 He went on to study studio art at College of Charleston, where he exhibited vast diversity in his student shows. By the time he graduated in 2000, he’d created everything from wall-sized oil paintings to outdoor sculptures of wood, cement, and twine. 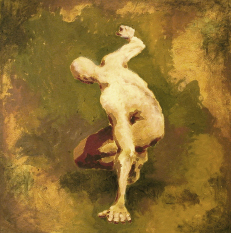 In the years following college, the young artist built a reputation around his paintings of soaring human figures. Always “looking for interesting motions to work from,” in 2003, he constructed “adult-size monkey bars in my backyard and had people make their way across,” he recalls. The result was a 13-painting installation, “Suspension,” at McCrady’s. Although some artists hone their skill on one particular medium, building a career out of consistent subject matter and output, Ailstock wanted to chase his various muses. “I got to a point where I felt like I was just doing something I was known for, and I wanted to find another method that would challenge me a little bit more,” he explains. Today, at Ailstock’s Avondale home studio, colorful landscapes and monotone wood-block prints of human figures share equal footing with vibrant abstracts. 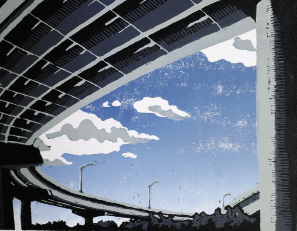 When the Cooper River Bridge was under construction, he found inspiration in the industrial overpasses forming gray ribbons through the air. “The only other reference in the works is this big blue sky, so they become celestial, and a little therapeutic,” says Ailstock of the landscapes in his “Looking Up” series. 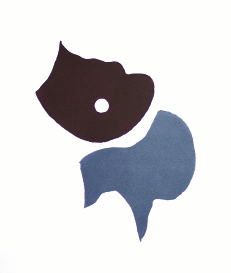 For his next exhibit, “Theory and Practice,” at Corrigan Gallery from January 18 to February 16, the artist is focusing on experimentations with abstract printmaking. For example, he discovered that he could control and cut Plexiglas in any shape he desired, leading to a series of colorful, overlapping shapes and patterns created on his etching press. Local designer Kathleen Rivers calls it “inkblot gone to the top,” praising Ailstock’s ability to balance an abstract piece’s yin and yang while confidently leaving large spaces blank. View Ailstock’s “Theory and Practice” from January 18 to February 16 at Corrigan Gallery, 62 Queen St., (843) 722-9868, www.corrigangallery.com.